Well, spring break is half over now and the break has turned to work. Spring work! My newest project which is top secret but I can say that Cane Creek is helping me out and making sure it is done right. These flashy new carbon 50mm wheels from Cane Creek showed up and one of those crazy AER headsets( the lightest headset on the market, the box is as heavy as the headset). Thanks goes to the boys down at Cane Creek for helping get the ball rolling and believin' in the wackey project. We repoed my super rad Ritchey bike bag also to do the check on Thrasher's bike to make sure we are packing and looking safe. I like the folding design and the extra room it has around the outside. Bries bike has been getting some fame in the last few days with the sprocket brake on it, its kinda a bummer being in culinary school so much we don't get to ride everyday like we use to. The shop has some new tools for some new big jobs. I just got crazy little Miller Maxstar Tig welder to do all kinds of misc jobs. Its one of the nicest welders I have used as far as welding steel and Titanium. Its like drawing a line with the sharpest pencil in the class. The welder is so crazy because it has the lowest settings on the market going all the way to 1 amp. About all welders starting amps are about 5 so welding things like something the thickness of a razor blade is not possible because it is to high and will burn up the blade, but this machine does 1 amp so you can get the most fine welds on something the size of a pin. The other new tool is the Cold saw fresh out of the crate and as new as they come. The saw will cut any kind of material and do it perfect every time. I also needed one of those Milwaukee power shears which after using I am hooked for life on that tool, its quite and smooth. One thing you never get when cutting sheet metal. The big job of the week is for a friend Jim who is starting a new bicycle shop in Santa Barbra. The project is to do over 70 bicycle racks that are 100% modular, the project is over half done and I will keep you updated on the progress tomorrow when I have most of them done. Well, everyone has been asking where I have been. I would post a picture of my shiny white coat but I don't want to scare you away. I havn't wore anything white in years, working with metal everything gotta be black or it will turn black. But, I wanted to let everyone know Monkey Likes Shiny is going Global next week, releasing a new product that the public has never seen before. 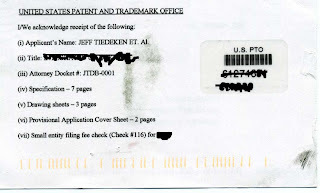 The patent papers are filed and the parts are being made, I hope your ready world !!! Dan and I have been working on this one for a while so we think its ready to take our product to market and show the world. Dan, its been a hell of a long ride ! My loves of metal crafting and culinary leads me to dig deep in the history books for cool stuff that cross both paths. Sometimes I come accross some neat things; most of the time they are all from the 1930s to the 1970s when metal and labor was cheap and it was easy to over build stuff. 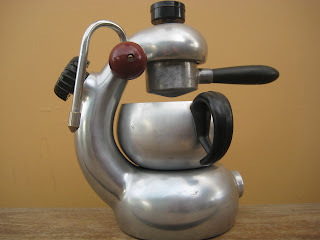 This time I ran accross a rad little espresso maker that was built in the late 1950s by a company called Atomic. The neat part about this little beast is it was a full sand casted aluminum construction. The idea was the maker to sit over an slow simmering flame while it the water starts to boil. Then it steams the espresso beans just like electric espresso machines at Starbucks and the steam also provides the steam for the milk. 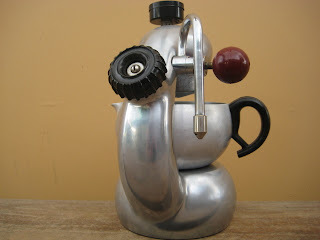 The cool part about this little beast is that anyone can make something like it. The design is very easy and simple but the company Atomic took the simple idea and threw some style on it. With school everyday but Friday, I was looking to fill that Friday up and make some extra cash. Long story short I recieved a call from Russell Mitchell of Exile Cycles asking if I would help them fill some orders and speed up the fabrication/welding because they were running behind. Exile cycles is a motorcycle company based out of North Hollywood, CA and their main products are custom motorcycles following their strict guide lines and their very refined products used for stock Harleys and custom motorcycles. Parts include gas tanks, frames, wheels, forks, ect. and they ship about half the orders world wide. I worked for Exile cycles about 4 years ago doing the fabrication and welding plus the Discovery Channel TV shows. It feels so weird going back there and working because it been so long since I worked there. The past few Fridays now I have been making gas tanks and welding stuff. Once you start doing it again it all comes back and you remember those little trick of the trade, its even neat to see some of my old inventions and tools still around hard tasks a little simpler. I even got to meet Josh the lead singer from the band Queens of the Stone Age and at the end of the day I got paid !